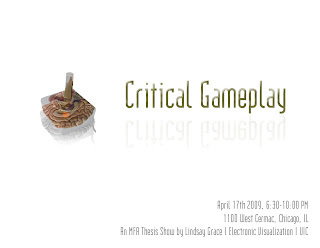 Critical Gameplay is a collection of strategically designed video games. Each game asks the question, what do common game mechanics teach us? The four games in the collection are designed to help reevaluate our perspective on gameplay experiences. Critical gameplay seeks to offer alternate perspectives on the way we play. The exhibition is open to the public and will be held for one night on April 17th.